One of our favorite foods is ramen. I've even been made fun of because of it! According to a co-worker, people over "a certain age" don't choose to consume ramen anymore. I'm not sure what that "certain age" is, but I will say I was in the under 30 camp at that point. Anyway, I'm here to tell you something different - if you agree with the person I worked with, you've clearly never had real ramen. I'm pretty sure ramen (in its many forms), is the food James and I would choose to eat forever if we could only choose one food. And I'm pretty sure it's not likely to change once we reach "a certain age." Now, I'm not talking about those ten cent ramen packets. I'm pretty sure most people won't get to "a certain age" eating those sodium and chemical laden packets on a daily basis. However, I will say I think those ramen packets do have a place - it's just not on my table on a daily basis. Now, real ramen, that's something I'd welcome. One ramen we often joke about is tonkatsu, or pork cutlet. 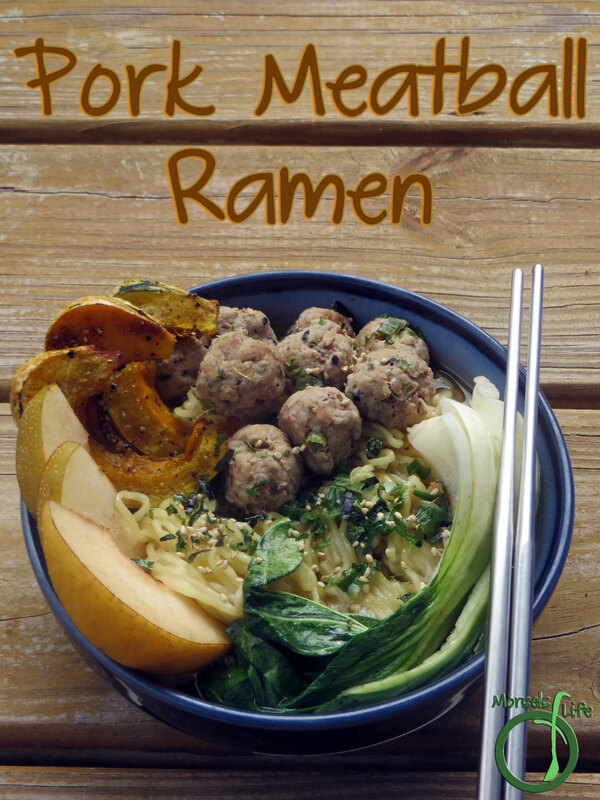 However, I had ground pork on hand, so I went with pork meatballs instead. Flavored it up with some ginger and green onions as well as the beloved furikake. I could eat these meatballs just by themselves! 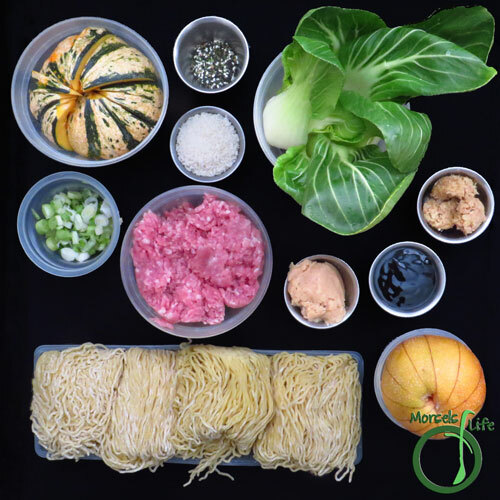 While the meatballs cook, you can quickly make a basic miso soup base and cook up the noodles. Then it's gobbling time! Do you have any foods you think shouldn't be eaten once you've reached "a certain age"? What are they? 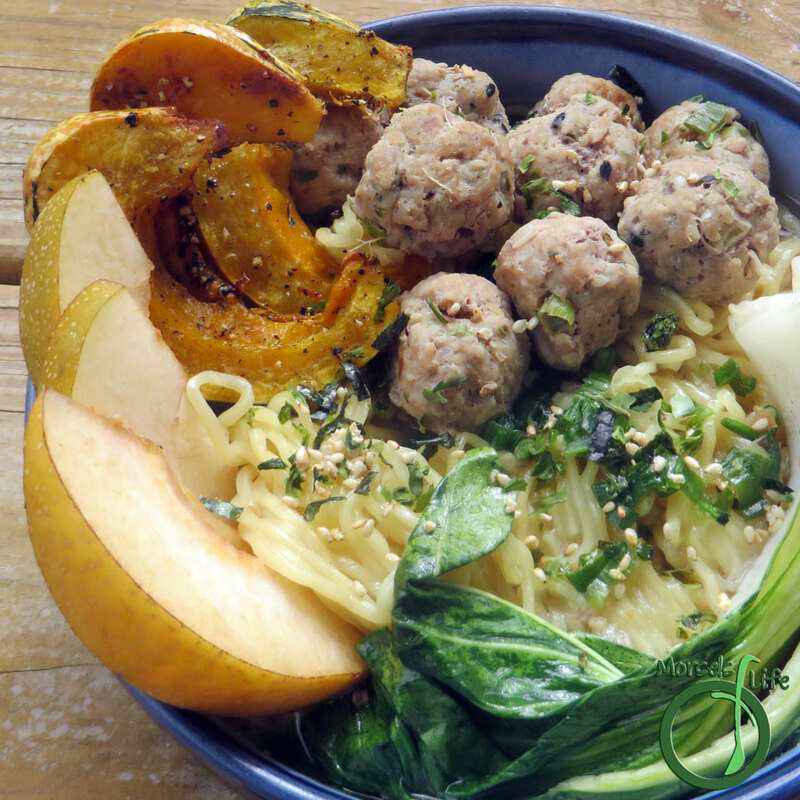 Fresh ramen, topped with ginger and green onion pork meatballs served in miso soup, then garnished with roasted winter squash for one scrumptious pork meatball ramen. 270 grams 9.5 ounces bok choy, washed and separated You can also substitute spinach. 382 grams 13.5 ounces 1 sweet dumpling squash, cut into wedges and seeds removed You could substitute another winter squash, such as delicata. 23 grams 3/4 ounces 1/4 cup breadcrumbs I used panko. 1/4 cup miso I used white miso. For a stronger flavor, you could also use red miso or a mix. 2. 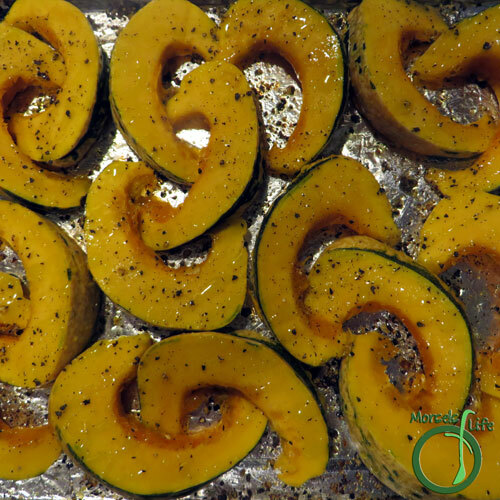 Place squash on a baking tray and spritz with oil. I also used a bit of pepper. Roast for about 15 minutes at 400F. 3. 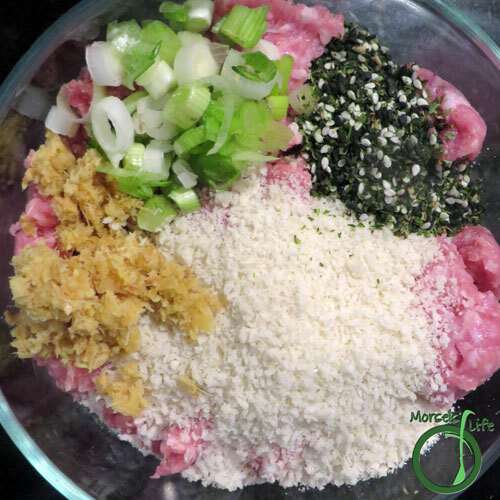 Meanwhile, combine pork, panko, half the ginger, furikake, and green onions, mixing until homogeneous. Form into meatballs, and heat them in a bit of oil until cooked through. 4. 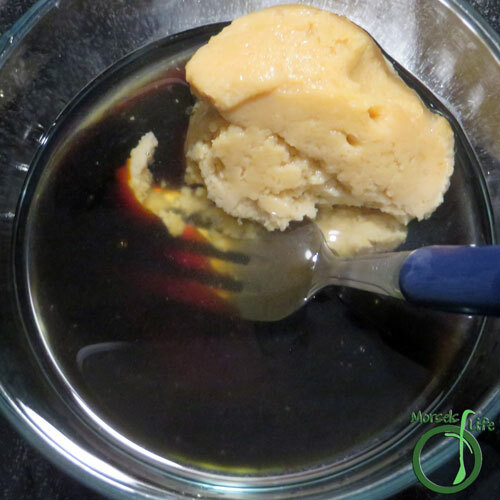 Mix together miso, ginger, and soy sauce, adding water to bring total volume to 4 cups. 5. 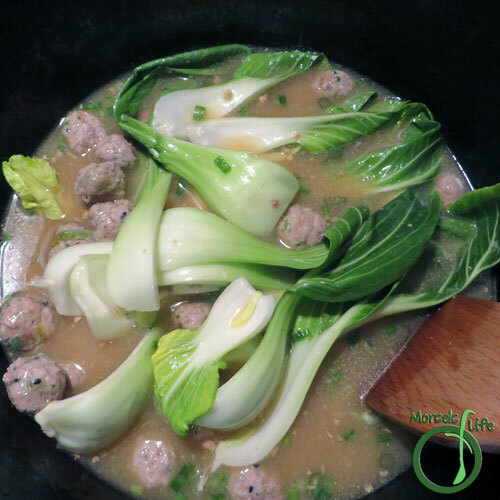 Add bok choy to pot with meatballs, along with sauce from Step 5, simmering until bok choy cooked to desired tenderness. 6. 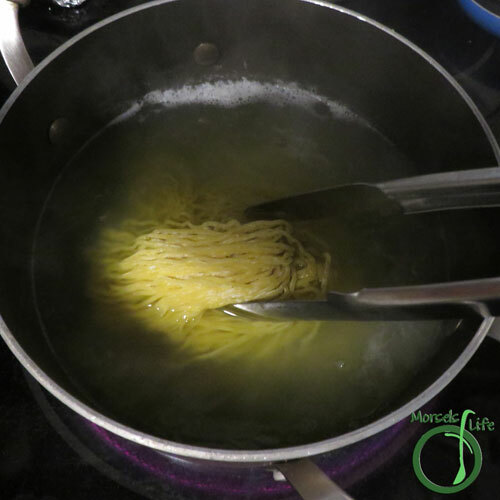 Cook ramen noodles following package directions. 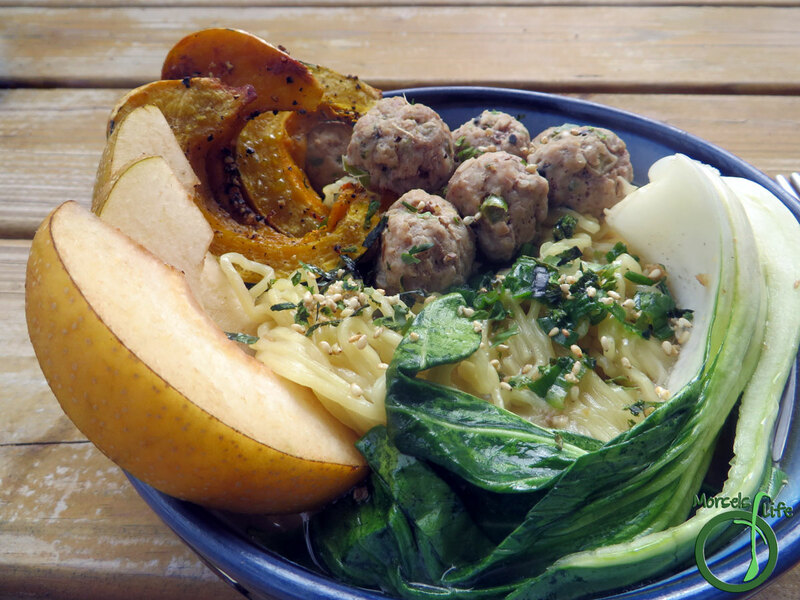 Place 1 serving of noodles in each bowl, and then add a quarter of the soup, meatballs, roasted squash, and Asian pear. Garnish with furikake and additional green onions if desired. You hit the trifecta this week CJ. I love all three. I think the only ramen I've ever had is from those sodium filled packages! They are pretty much a staple for young, poor college students, or at least they were when I was young. Thanks for sharing at the Blogger's Pit Stop. They're still a staple in colleges. :) (And I won't say we never, ever, ever, ever eat them, but after trying the (at least somewhat) real stuff, we're much less tempted.) Hope you enjoy! Ha! Well there's ramen and thern there's ramen, right? This is a lovely bowl of goodness! Thanks for sharing with us at Throwback Thursday! I love that there is still a stigma against ramen eaters. In our circle of friends everyone has move onto eating pho which to me is just fancy ramen noodle soup. I'll have to try this one out on my hubby. He's a ramen eater, but I don't think he's ever had "real ramen". Thanks for the recipe! PS - I found you through the Turn It Up Tuesday Link party page from last week. Can't wait to see what else you post!